From 1804 to 1806, Meriwether Lewis and William Clark led an expedition to explore the region from the Mississippi River to the Pacific Ocean. 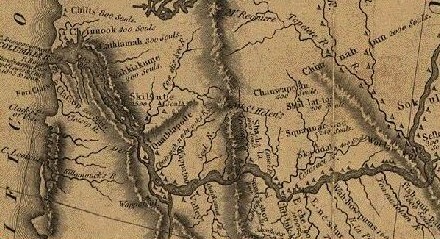 The map shown here is a portion of a larger map that Samuel Lewis copied from the original drawn by Clark. It is titled "Across the Western Portion of North America from the Mississippi River to the Pacific Ocean." This section shows the Columbia River flowing through the current states of Washington and Oregon to its mouth at the Pacific. Along the edges of the river are the names of various Native American tribes that the expedition encountered along with the number of people at each site.